Grand Christmas Board of Fortune Game (2017) - Guess Who's Who? Discussion in 'Manchester United Forum' started by Edgar Allan Pillow, Dec 12, 2017. 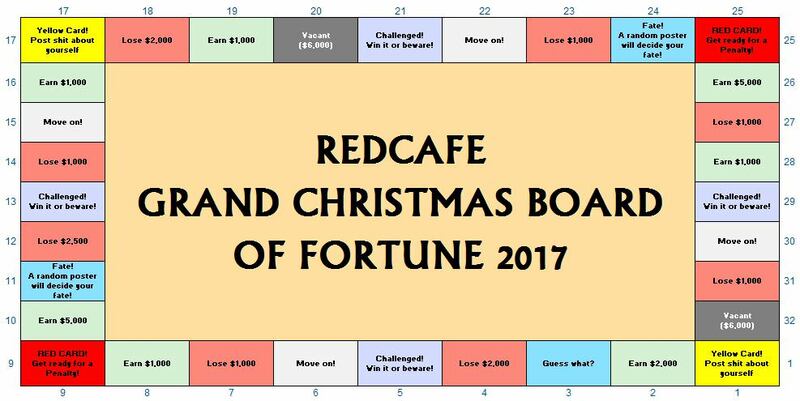 GRAND CHRISTMAS BOARD OF FORTUNE 2017! Every Turn, I'll randomize a set of numbers and allocate to all players. The number allotted represents the number of boxes you move for the turn. The criteria for destination boxes applies to you for the turn. Everyone starts outside (at Box 0). For example, if you roll a 5 in Turn 1...you move to Box 5. I'll post up the challenge criteria and all posters in Box 5 should comply or risk the wrath of Golden_Blunder! If you win or lose money please tally up yourselves. I do not distinguish between unintentional errors and intentional cheating. So any mismatches will result in penalties. So better make sure! Yellow Card - Self inflicted. But beware, if post is not upto scratch, it'll turn to a Red Card! Challenged! - You'll be set a task by me. Prizes and penalties will be tagged to the task. Guess what? - Keep guessing. Prizes and penalties will be tagged to the question. Move on - No prize. No penalty. Take a break! Fate! - A random poster decides your fate. Prizes and penalties will be tagged bythe poster. Vacant! - If you land in that box AND are spend $6,000, you can buy that box. Post that you can decide set a criteria for everyone else who lands in that box in subsequent turns. Top 3 earners get the prizes! Lock poster into specific forums. Demote a mains poster to newbies. Be the only non-staff poster to sport a Custom Banner of your choice! Ta Da! An Avatar of your choice. Quite special as this has been disabled and not even the modmins have the power to grant this. A special one-off privilege granted thanks to @Niall that may never again get repeated (at least not until next year's game) forever! * All prizes will be for a limited period of time! The standard forum rules apply! Just remember what goes around comes around. You'll have an equal opportunity to get yourselves banned, locked, user names and taglines given, taken or changed at the mercy of evil modmins led by the CEO (Chief Evil Officer) @Penna . You've been warned! Win or lose, it'll be chaos. It'll be fun. Joy, Pain, meltdowns...you can experience it all! If you're interested in playing, sign up by posting "I'm Playing" + your username below! When signing up please indicate your box choice (between #1 to #6) in sign up post. Game starts 14th Dec 2017. Everyone who want to play choose a box between #1 to #6. Make a wise choice as your fortunes are tagged to this! If you've already signed up, edit your post to add in your box choice. Sign up. You'll get pulled along for the ride! Oh, there may be a lil bit of this and that to do. You are literally satan. Read the OP. Also, everyone, you don't need the '+' in your posts. @The Cat nailed it. Box Number 5 if you please, too. Box 3 if you please. I'll make them up as we go on. The best kind of rules. Sounds like how I live my life. Ahh, The wheel of the newbs is reborn! Plot twist, only one newbs and mains poster is welcome and mass bans await everyone else that signs up. Newbs and Mains poster welcome! Why isn’t banning posters the grand prize? Wait, so what's the worst punishment from this? Perma ban lol? Yes, in the newbies. Thread is in the General now. This is potentially the best Christmas ever.